OBA Bulk Terminal Amsterdam is a leading dry bulk terminal in Western Europe specialized in transhipment, storage and processing of dry bulk commodities. Since the start in 1954, OBA has built an outstanding track record in providing high quality service to customers in various industries, e.g. the steel and animal feedstuff industry. 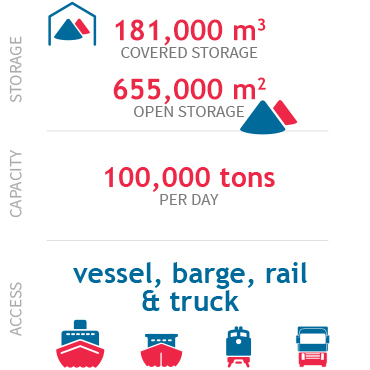 The multipurpose terminal is strategically located in the Port of Amsterdam. With the high quality covered and open storage capacity OBA is capable of handling an annual volume of up to 22 million tons of various dry bulk commodities. Modern facilities guarantee fast and efficient unloading and loading of the largest seagoing vessels, as well as barges, trains and trucks. In addition, OBA offers multiple added-value services such as screening, blending and washing. The excellent water, rail and road connections combined with the outstanding transhipment and storage capabilities enable OBA to meet today’s customer demands, as well as the challenges of the future. That is exactly why OBA is investing in a new 40,000 cbm multipurpose shed to further diversify into other dry-bulk commodities, products that often require high quality covered storage and state of the art processing equipment. This multipurpose shed is located at a storage area previously used for the storage of steam coal.